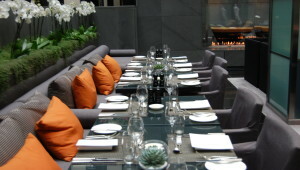 Grosvenor House Apartments on Park Lane, a Jewel in The Jumeirah Group crown, for a private lunch with twelve HedgeBrunch guests. With a sterling range from across the sector these guests represented many different areas of interest, making for a very fruitful afternoon. Individuals in attendance came from a family office, a start-up fund, a prime broker, a consultant, an administrator and an asset raiser to name a few, all were welcomed by our partner, Jersey Finance, for the occasion. 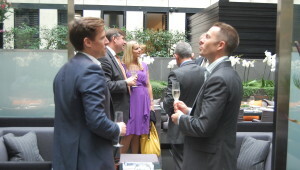 Gathering in the spectacular private Atrium, we were welcomed with a chilled glass of champagne and guests quickly found their groove, picking up on old threads and new connections in equal measure. All present were very much in the emerging-manager mindset and it was clear this was going to be an occasion where fast-friendships and beneficial relationships were going to be forged. Grosvenor House Apartments were consummate hosts once again, this being a follow up occasion to our recent HedgeBrunch Club Brunch event held in the penthouse on September 3rd. After a few more glasses of fizz and with all the how-do-you-do’s done, we were presented with a specially tailored HedgeBrunch and Jersey Finance menu. With Pan fried Foie Gras or Roast butternut squash soup to start, quickly followed by Wild Sea Bass or Homemade Taligio Ravioli, it’s clear that the menu in the Atrium is far from an after-thought. Of course, work debates and topics took centre stage but there were definitely a few brief moments of silence as we enjoyed the meal with vigour. Talk turned back to the various interests of guests at the table but the duality of the emerging manager opportunity and struggle remained at the fore throughout. Being a private space, and not just any hotel lobby one can walk into off the street, the Atrium affords dining guests the chance for the quick side-bar chat safe in the knowledge that they have privacy. Between courses, most took the opportunity to do so and it’s safe to say that each and every one present benefitted from connecting with everyone else there. To hear more about these events sign up here, or to be seated on the next table please register your interest.